The newspaper under my door in the morning is an interesting read. It is a Hindu paper (the Hindustan Times) but in English, and appears to contain as much spin as it does news, though the pages devoted to arranged marriage ads is diverting – owning a house or having the right to settle abroad appears to be a bonus, there is a separate section for divorcees and even an ad from a couple in New Zealand seeking a wife for their son, who has a good job in Sydney. 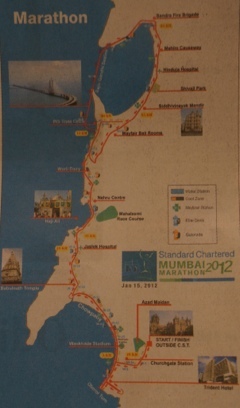 Of more interest is the map on the back page, for today is the day of the great Mumbai marathon! I can’t say I’ve noticed anyone out jogging since I’ve been here – the heat and pollution would be enough to put off most mortals – but the newspaper has photos of the Ethiopian team training in their track suits, and a map of the route which, conveniently, runs directly past my hotel. There are regular updates on TV (the run began at 6am, though there are shorter publicity runs for celebrities and fundraising groups later in the morning), and Bollywood stars pop up with soundbites about their love of running and their support for various charities. 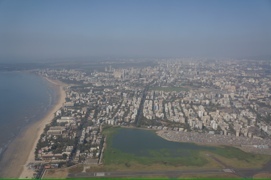 The marathon is sponsored by Kingfisher – whether the beer or the budget airline is unclear, though given the latter’s financial difficulties the former seems most likely. They’re both owned by the same family, in any case. I wander out along D. N. Road after breakfast, following the route for a kilometre or so. It’s not quite the London marathon, with only 38,000 participants this year, but the event is only a few years old, and it’s growing. 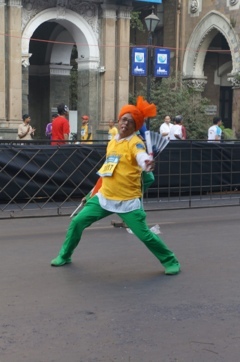 As well as the regular runners, there are unlikely groups of elderly Indians waving banners, who seem to be walking a much shorter course, and a few brave souls in fancy dress. This guy was loving it. Along the way, I pass the marker for the final 1km. A few girls in jeans carrying pompoms stand in a row on a small stage, giving the pompoms an occasional hesitant shake, as though not really sure why they are there and not really wanting to bring attention to themselves. Next to them a man with big hair and the unmistakeable tones of a radio DJ does his best to drum up excitement in the small crowd of spectators lining the route. By midday, when it is time to catch a taxi to the station, the roads have reopened, and the last stragglers must compete with regular Saturday traffic as well as their own exhaustion for the final stretch. I’m looking forward to my first long-distance train journey, an 8 hour stretch to Aurangabad, near the northern border of Maharashtra. Despite my fears, the station is crowded and the correct platform and carriage stop are easily found. As I look for a place to perch with my pack, another traveller comes up to me and asks if I’m heading to Aurangabad. I can’t quite place her accent, which turns out to be French Canadian. Alizé is part way through a year away from home, and fresh from a stint on the Christmas markets in France. By happy coincidence we are on the same carriage, and arrange a sneaky seat-swap so that we can sit together. AC chair class is a pretty comfortable way to travel. It’s still pretty cheap, but the seats are like airline seats, with a lot more legroom. Even with AC the carriage is reasonably warm. 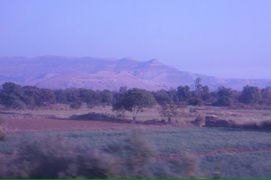 Unfortunately the windows are tinted, so the countryside all the way to Aurangabad takes on a blue tinge. The landscape, once we escape the city, is rocky and desert-like. We pass dry rice-paddies, cornfields reduced to rows of husky stumps, the plants themselves stacked in high pyramids to dry. There is the occasional ravine with a trickle of water at the bottom, and anywhere there is a trickle of water there is also an array of colourful washing drying in the sun. People walk along the tracks next to the train, some with huge loads on their heads. A man on a bicycle is nearly invisible in between a huge pile of sugarcanes. There are small clusters of houses, more of mud huts with tin or thatch on the roof. Then, unexpectedly, a row of shiny wind turbines appear on a ridge up ahead. Inside the train, the aisles are a stream of attendants and a random assortment of vendors. 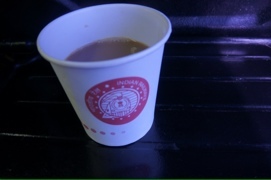 There is the chaiwallah, the coffee wallah (I try one – it is Nescafé, which I expected – but it comes in only one variation: milky and sickly sweet), there is a boy of about 14 hawking small plastic helicopters (his double appears later selling “magic” wipe-off plastic books), the official train attendant selling bottled water and frooti, and the official in-house catering service, which comes in veg or non-veg. 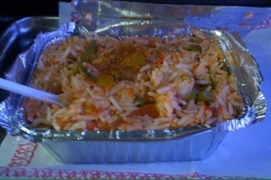 We opt for the veg, which turns out to be greasy fried rice. Still, there is plenty of it and it’s cheap – about 100 INR for the meal and the coffee (about $2). At Igatpuri the train stops, and vendors on the platform swing into action, hoisting huge bowls of samosas and pakoras onto their shoulders and winding through as many carriages as they can manage before the train engine revs again. Each vendor has a distinct cry – one, who seems to be selling sweets, roams the train calling “cheekywallah, cheeky cheeky”. As dusk begins to fall, just past Nasik Road, I notice two small boys flying kites from a roof top. Then another, and another – for the next few hundred metres there must be a hundred kites. Leftovers from Makar Sankranti? We finally pull into Aurangabad station, to be greeted by chaos. The train terminates here, so it’s everybody off, and pushing and shoving to find the entrance. My hotel has sent a car to meet me, and we cause the young driver no end of confusion trying to get him to drop Alizé at her hotel first. He just wants to “chello hotel!”, but eventually we sort it out. I’m a little disconcerted to be kept waiting 30 minutes or so when I arrive – it’s 10pm and all I want is sleep, surely they knew I was coming! But after a brief sense-of-humour failure I’m finally allocated a room and collapse gratefully into sleep. I’m loving these posts, Natalie! How interesting the whole trip sounds. The writing is just great, you really make me hear, see, feel every part of what you describe. Maith thú!